Digital Painting offers a huge variety of creative opportunities – from classic sketching or painting like on paper, working with photo references and composition to retouching of traditionally painted artworks. 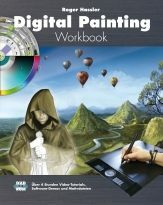 The Digital Painting Workbook provides an introduction into digital painting techniques. It gives an overview on fields of application, requirements in hard and software as well as printing options of digital art. Basic functions of Adobe Photoshop and Corel Painter are described and the focus is on detailed tutorials for digital painting motives such as still life, wildlife, portraits, fantasy and landscape artworks. All tutorials can easily be worked by beginners using almost any painting or image processing software. Roger Hassler was born in 1972 in Hameln/Germany. He is working as graphic designer in the elds of print and web design in his own studio and publishing house in Hamburg/Germany. In the field of airbrushing he has many years of experience. In his youth he started as a renowned computer graphic artist. Later, he developed his skill in classic painting techniques which led him to the art of airbrushing. He taught himself the technique and quite soon also started teaching other enthusiasts. His photorealistic artworks feature motifs from the fields of fantasy, air planes, science fiction and surreal figural illustrations. For more than 10 years he has been publishing a variety of books, DVDs and magazine articles on airbrushing. Painting talents and all those, who want to design their works on the computer in the future, are highly recommended to buy the book “Digital Painting Workbook“. Roger Hassler gives a superb introduction into the possibilities of digital painting and offers workshops at different skill levels and various topics. Additional video tutorials on DVD prove to be very helpful as an ideal complement to texts and images.